Mirror photo by Gary M. Baranec / Sgt. R.J. Peo, with the Blair County Sheriff’s Department, and his wife Dana look up as a Pa. State Police helicopter flies overhead during a ceremony for the department’s canine officer, Lily, on Wednesday outside the Blair County Courthouse. Peo was Lily’s handler. 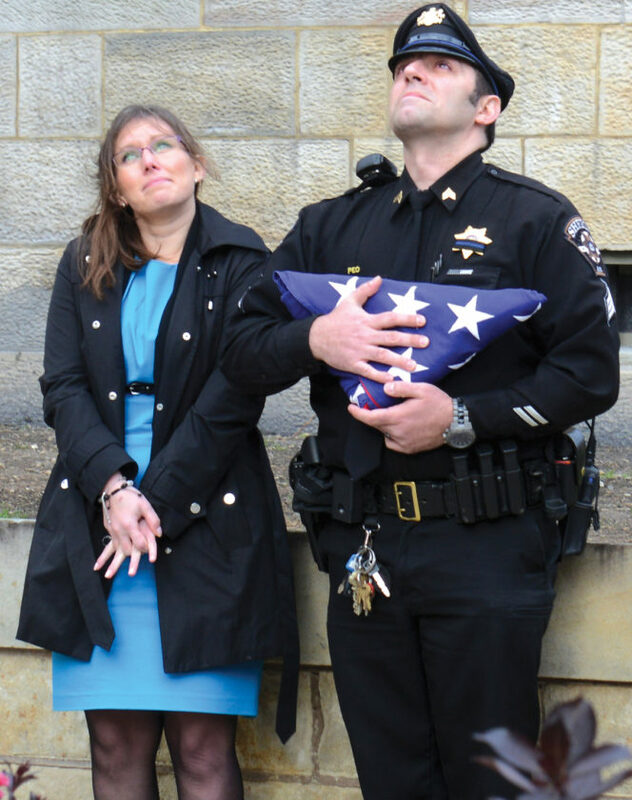 HOLLIDAYSBURG — The Blair County Sheriff’s Office remembered its first canine officer Wednesday afternoon during a memorial service with bagpipe music, a three-volley salute and the presentation of an American flag to her handler, Sgt. R.J. Peo. Lily, 13, died Sunday morning at home with Peo and his wife, Dana, who participated in the memorial service where they and others offered their last salutes in honor of the canine officer. Ott said the memorial service came together quickly with support from other law enforcement agencies, including the Pennsylvania State Police, who flew a helicopter over the service in recognition Lily. The event drew about 60 people, in addition to the participating sheriff deputies and police officers. Before joining the Blair County Sheriff’s Office in 2013, Lily was in the care of the U.S. Army Special Forces, which assigned her to two tours of duty in Iraq and two in Afghanistan. By the time the military released her, she was recognized for having identified 700 roadside bombs and apprehending three suspected terrorists. And while working with Peo, Lily’s expertise in bomb-sniffing made her an asset as well as a recognized officer in responding to bomb threats and when called upon to assess the contents of an unidentified package. R.J. Peo carried Lily’s ashes in a wooden box during the ceremony and shared his sorrow with his wife. “He and Lily had a special bond,” said Dr. Kendra Itle, Lily’s veterinarian at the Hollidayburg Animal Clinic, who attended the memorial service with several staff members.